That taste, that feeling, lingers in my mouth and on my lips from the day's fishing and the smoke swirling slowly around my head in the dense, dripping, post-thunderstorm air stings my eye's memories. 47 ring size. Dominican Perfecto. Bought at the deli who's selection is infinitely better and fresher than the cigar store the next town over. Those things may kill me. Or not. We roll the dice each time we exit the door and wading deep, rough water or driving on I-84 is more likely to kill me than hand-rolled, Cameroon-encased joy. Rationalization, I suppose. I only smoke on the water which may be my one concession to managing my addiction, even though I occasionally have one at home. And, rarely, other places. I like them with scotch. Or beer. Crisp, fresh water is good on the stream on an unseasonably hot April day. So is a cigar. 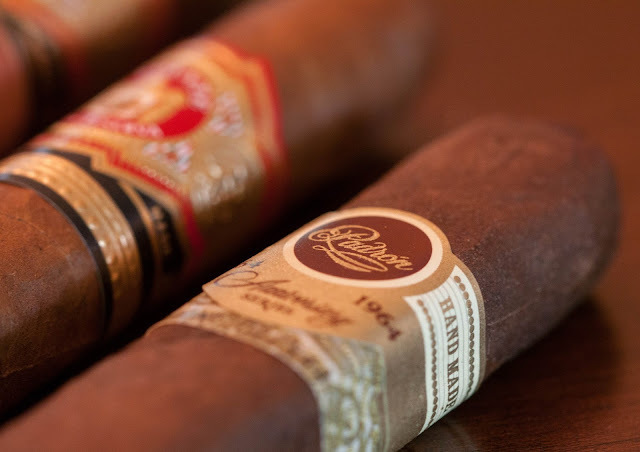 Three in a cigar case. Two for me, one to offer a friend just in case he's wanting. Lacking a friend the third is in reserve though the reserve rarely lasts the day, though it did today. When the fishing is good, regardless of the catching, even desire can be dampened. Well written. And thanks for carrying the third. Nice post.... I miss smoking so much. I was able to roll a cig nearly as fast as Willie Nelson. I still enjoy a smoke on the water also, but tobacco is no longer an option. Always three. One for the fish. One for the tree. One for a buddy (for $5, if it's working). I love the way this is written. I'm in the same boat as you. Only smoke on the water, or maybe one at home, and maybe one more just because. Well done Steve. Thank you, Ben. Here's to managing additions! I no longer smoke, or drink... if it's your enjoyment please enjoy away. That day at the small stream I did enjoy your smoke. Thanks. Always happy to share in whatever form it comes. I also love a good cigar when on the stream. Also, you can't overlook the mosquito repelling qualities of a good cloud of smoke around your head.